We have struggled financially living and growing up in Oakland after coming from Mexico. But even though my parents may feel like they didn’t give us the better life they would’ve wanted, due to our financial struggles, I think they did. Four out of the five of my sisters are first generation college students. We were able to get this far thanks to the hard work of my dad and the support of my mom. My dad always told us the importance of higher education, since he knows what it is like to not have it. When I was little I was never aware of my immigration status. I thought I was just like everyone else. Until I got to my senior year in high school is when I started to become aware that I was undocumented and that I couldn’t go to Mexico or travel anywhere outside the U.S. Even though I am undocumented, I never saw it as something to be ashamed of. I took pride in it because of the hard work of my parents and their sacrifices. 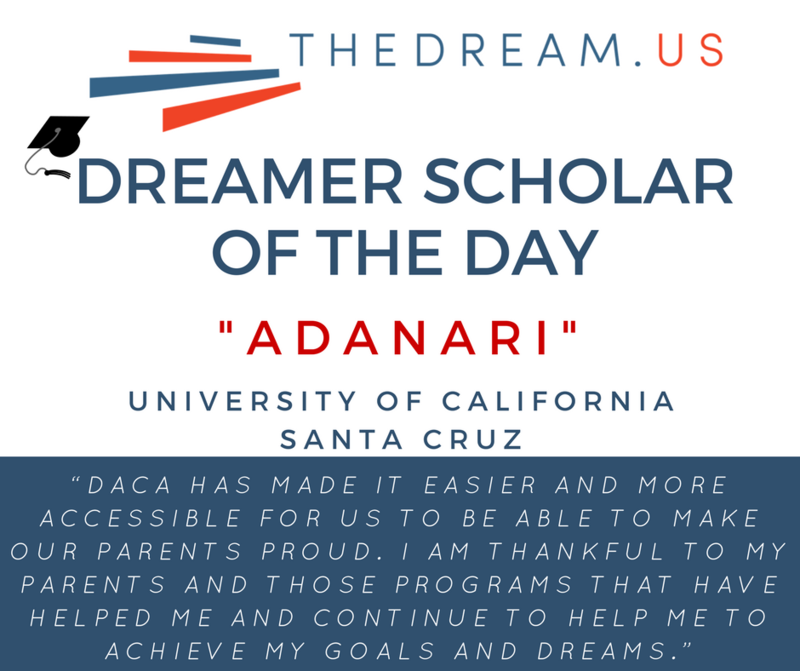 DACA has made it easier and more accessible for us to be able to make our parents proud. I am thankful to my parents and those programs that have helped me and continue to help me to achieve my goals and dreams. I have a passion for art and I hope one day I can use my art to inspire and create change in the community. I want to use art to help youth find a way to heal and to express themselves and their concerns about the many struggles they go through. Currently I am doing field study in Richmond, CA at an organization called RYSE Center. RYSE creates safe spaces for youth to transform, heal and love their communities. After graduation, I want to work to help youth affected by violence and to build better communities reduced of violence. I want to challenge the systems that target youth to become involved in the cycle of violence. DREAMers have to work harder; we have to show society we want to be successful and we want to benefit everyone around us. I want to help youth and help them have the opportunity to receive a higher education. I want to work to serve my community and support my church community and to give back to my parents, who sacrificed so much for my sisters and me.